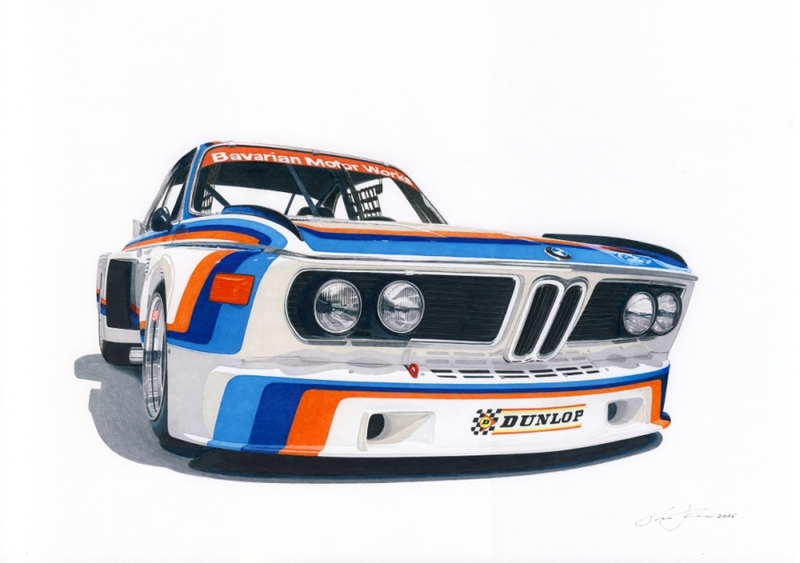 Please complete my order by substituting a print of each the CSL and the Brabham. Thank you. I’m very impressed with your photorealistic style of rendering and beautiful use of color. I encourage you to illustrate additional BMW racers, as I only collects BMW photorealistic art. Place me on your subscriber list and notify me when you make additional BMW images available. Suggestions ( CSL Schnitzer “Gosser Beer”, Brabham BMW BT52, M1 Group 5 “ Pioner Electronics”, or Japanese Champion M1 Group 5 “ Lucky Wheels”, M1 ProCar, E30M3 DTM (any Iconic liveries), IMSA McClaren GTP), or any BMW racer you find fascinating. Happy motoring, James. Thanks for your order. I am glad you like my work and thanks for the sugestions. I will definitely let you know when i will do more BWM related work.